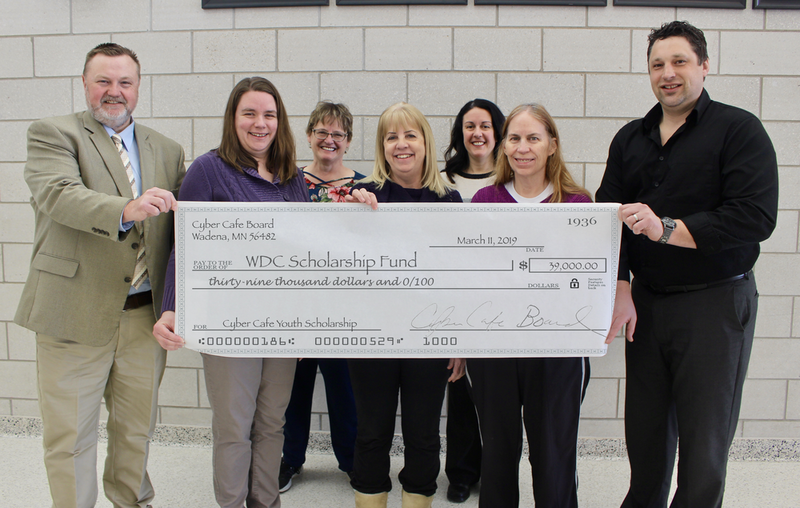 At the presentation of the Cyber Cafe's $39,000 endowment included members of the Cyber Cafe Board and Wadena-Deer Creek school representatives, from left: WDC Supt. Lee Westrum, WDC Counselor Toni Kraska; and Cyber Cafe Board members Cindi McCullough, Kathy Yelle, Stephanie Drange, Ann Pate and Randy Jahnke. Photo by Dana Cantleberry, WDC Schools. "We are so grateful that the Cyber Cafe Board has chosen to continue to invest in the future of the students of Wadena-Deer Creek." said Toni Kraska, WDC High School school counselor. Several Wadena-Deer Creek sixth-grade students were recognized for their Lions Youth Outreach Posters. Armed with orange flags bearing the stop sign and bright-yellow vests, the Wadena‐Deer Creek Elementary School Patrol takes great pride in helping students, staff, parents and the public cross school intersections safely before and after school. Wadena-Deer Creek’s FCCLA members were fortunate to get to meet Gwen Walz, Minnesota's First Lady. in St. Paul. Pictured, from left: Emma Mehl, Angela LeComte, Morgan Grangruth, First Lady Gwen Walz, Elliot Doyle, Frannie Bakken, & Casey Bounds. Photos by Cindi Koll, FCCLA Advisor. Six Family, Career, & Community Leaders of America (FCCLA) members visited the state capitol on Feb. 11 to attend MN FCCLA Legislative Shadow Day. This year’s FCCLA state theme of “Land of 10,000 Dreams” encourages students to row their boat to success, catch a multitude of leaders, and dive into career paths. 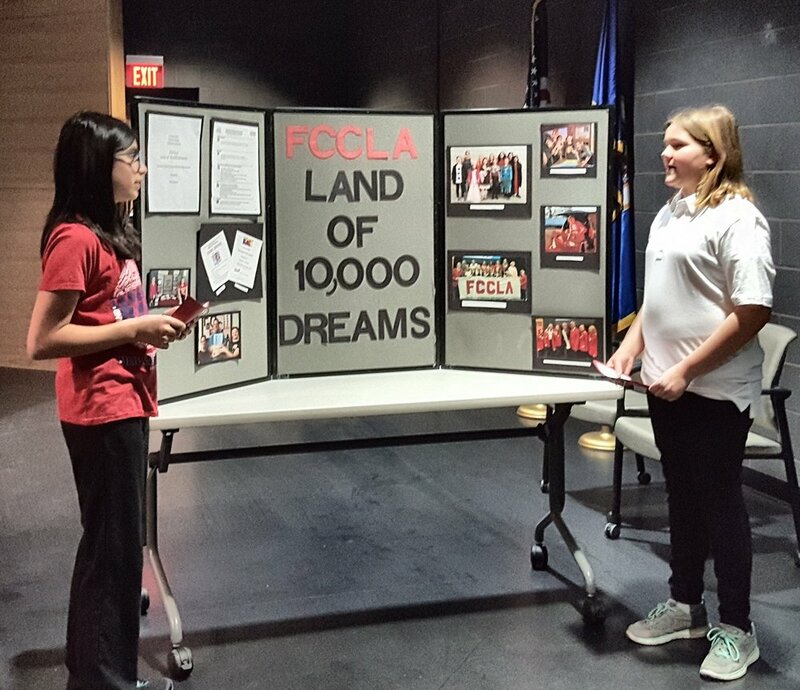 WDC’s FCCLA chapter to celebrate National FCCLA Week, Feb. 11-15. Pictured at the signing, sitting: Steven Thomas and his mom, Victoria Hunt; standing, from left, Abra Hunt, Steven’s dad, and Norm Gallant, WDC activities director/assistant football coach. Signing photos by Dana Cantleberry, WDC Schools. Wadena-Deer Creek senior Steven Thomas signed a Letter of Intent recently to play football for the Valley City State University (VCSU) Vikings the fall of 2019. 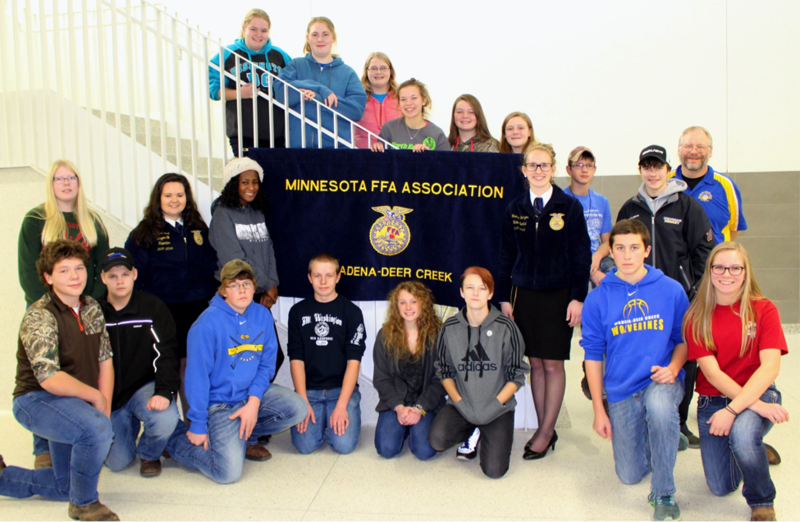 The Wadena-Deer Creek FFA Chapter was recognized as a Two-Star National Chapter at the 91st National FFA Convention held in Indianapolis, Indiana. Those WDC FCCLAers who attended, from left to right, Caleb Cully, Elliot Doyle, Angela LeComte, Emma Mehl, Morgan Grangruth, Madyson Beversluis, and Mikayla Varela. Seven Family, Career, & Community Leaders of America (FCCLA) members from Wadena-Deer Creek High School recently attended the November Summit Leadership Training at the Kelly Inn in St. Cloud.